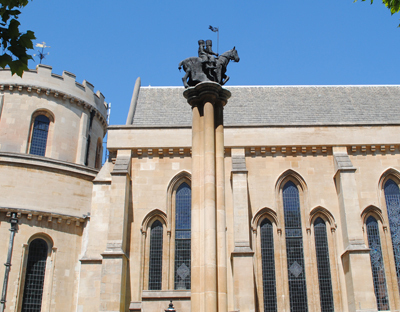 Standing outside the Temple Church, in the west of the City of London (between Fleet Street and the River Thames), stands a pillar topped with a pair of Templar knights riding a horse in an obvious commemoration of the military order that once had its preceptory here. But what many people don’t realise is that the column was also erected, apparently like the Golden Boy of Pye Corner, to commemorate another point where the all-consuming Great Fire of London was finally stopped. The 10 metre high column was erected in 2000 (another of its purposes was to mark the millennium) in what was once the cloister courtyard of the headquarters of the Templars, which had originally founded to protect pilgrims to the Holy Land in 1119. The bronze figures of the two men atop a single horse which caps the column was a representation of the image found on the order’s official. It represents the poverty of those who initially joined it – so poor they could only afford one horse for every two men, a situation which was to change dramatically in coming centuries as the order accumulated wealth, a situation which, eventually, in France, led to its downfall. London Remembers reports that the column was designed in the gothic style, similar to the Purbeck marble columns in the church (which, incidentally, are said to be the oldest surviving free-standing examples of their kind) and deliberately made to contrast with the more florid column of Sir Christopher Wren’s Monument, which marks where the fire started and, also, according to a signboard, “the arrival of the new classical order”. For more on Temple and the Temple Church, see our earlier posts here and here and here.